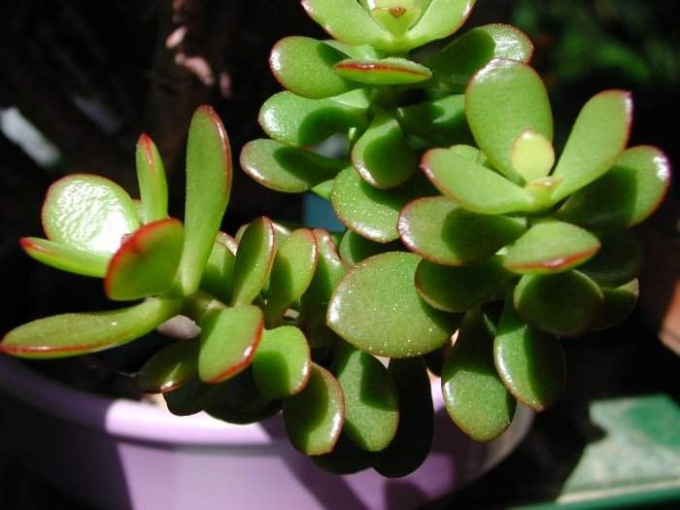 The jade is a houseplant native to South Africa, which is popularly known as "money tree". Like any plant, it will grow there, which has created the suitable environment for its life. It is believed that the higher the money tree, the more wealth is in the family. But sometimes the plant begins to drop its leaves and then ceases to grow and dies. This can happen from improper pruning, and if not from its absence. Cut jade in cases when the tree grows upwards and not sideways. For better growth of the lateral branches, you must remove the top Bud, which received a large number of nutrients and therefore have developed rapidly. After it is removed will start the development of the lower buds. Of them will soon grow new branches with their kidneys. It is important to keep the top buds were fed uniformly. It is easy to see: if one of the branches grows faster, then she started to get more power. To crown not spoiled, this kidney should be cut off. In winter, the plant usually stops its growth. Cutting off the top Bud during the winter, the chance of developing new branches will be small. If new shoots come out, due to the lack of light they will be spindly and unattractive. But if you cut the jade spring, the growth of the kidneys will be uniform, and the plant will be lush. If your plant does not require a radical haircut, and you just want to tweak him a crown, cut the curved and gnarled branches - cut them to the warp. After some time, the place the crop will become invisible under the fresh shoots that come out soon after trimming. Thin branches and dead leaves, you should pinch off with your fingernails. After a light cutting on the plant will remain penechki and broken place quickly "heal" and give the progress of the new healthy shoots. Wooden seats cut with scissors or shears. In the spring the buds are easier to Wake up and clipped the branches root better. If you cut the jade in the cold season, the plants create conditions of peace, no weak growth.